The Flowers slot machine is a game that has been around for years and yet has unique and original features, which makes it fun to play on. That is possible in Oranje Casino on the mobile version or simply in the online casino. The extensive bonus features may be missing, but instead you get something else, namely a cheerful image of flowers in all sorts of colors that predominate as symbols in the game. There are five reels and three rows in the game and you can play on thirty paylines. There are various settings that can be adjusted by the player, such as the coin value and the bet level. 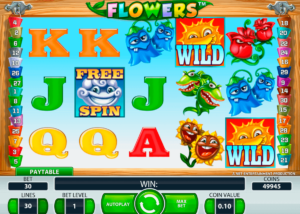 An original game feature of the Flowers slot machine is the function of the double symbols. A double symbol can be recognized by the image of two flowers instead of a single flower. The special thing about this symbol is that if a double symbol appears on the reels, the symbol counts for two. There is then only one equal symbol to be connected to be able to speak of a winning combination. If you see a double symbol with the same flowers on all reels, then there is a winning combination of ten symbols. The double symbols must be in the correct position on active paylines. While playing, free spins can also be won. A free symbol can appear on the reels as a single symbol, but also as a double symbol. In this game, therefore, access to the round with free spins is only given when four free spin symbols are displayed. That can also mean that only two free spin double symbols need to appear. During the round with free spins, a profit can be achieved and this is then multiplied by a factor of three. Furthermore, a separate feature is available during this mode and that is that stacked wild symbols can be added. This increases the chance of winning combinations. The maximum number of free spins that can be won is 30 free rounds. It depends on the number of symbols how many free spins are won. With four symbols, that means 10 free game rounds and with each additional symbol, five free game rounds are added, so that with eight symbols 30 free spins are obtained. five are set. The coin value can be set to a maximum of 0.50 euros and if there is then played at level five, there is a bet of 75 euros per turn.